Geriatric use. Grade 3 or 4 adverse events were higher in patients aged ≥65 years who received lenalidomide than in younger patients. Renal impairment. The starting dose of lenalidomide should be adjusted based on creatinine clearance value and in patients undergoing dialysis. 1. National Cancer Institute. A snapshot of myeloma. November 5, 2014. www.cancer.gov/researchandfunding/snapshots/myeloma. Accessed February 28, 2017. 2. National Comprehensive Cancer Network. NCCN Clinical Practice Guidelines in Oncology (NCCN Guidelines): Multiple Myeloma. Version 3.2017. November 28, 2016. www.nccn.org/professionals/physician_gls/pdf/myeloma.pdf. Accessed February 28, 2017. 3. American Cancer Society. What are the key statistics about multiple myeloma? Revised January 2017. www.cancer.org/cancer/multiplemyeloma/detailedguide/multiple-myeloma-key-statistics. Accessed February 28, 2017. 4. Kumar SK, Rajkumar SV, Dispenzieri A, et al. Improved survival in multiple myeloma and the impact of novel therapies. Blood. 2008;111:2516-2520. 5. Petrucci MT, Giraldo P, Corradini P, et al. A prospective, international phase 2 study of bortezomib retreatment in patients with relapsed multiple myeloma. Br J Haematol. 2013;160:649-659. 6. Mewawalla P, Chilkulwar A. Maintenance therapy in multiple myeloma. Ther Adv Hematol. 2017;8:71-79. 7. US Food and Drug Administration. Lenalidomide (Revlimid). February 22, 2017. www.fda.gov/drugs/informationondrugs/approveddrugs/ucm542791.htm. Accessed March 3, 2017. 8. Revlimid (lenalidomide) capsules [prescribing information]. Summit, NJ: Celgene; February 2017. 9. Attal M, Lauwers-Cances V, Marit G, et al; for the IFM Investigators. Lenalidomide maintenance after stem-cell transplantation for multiple myeloma. N Engl J Med. 2012;366:1782-1791. 10. McCarthy PL, Owzar K, Hofmeister CC, et al. 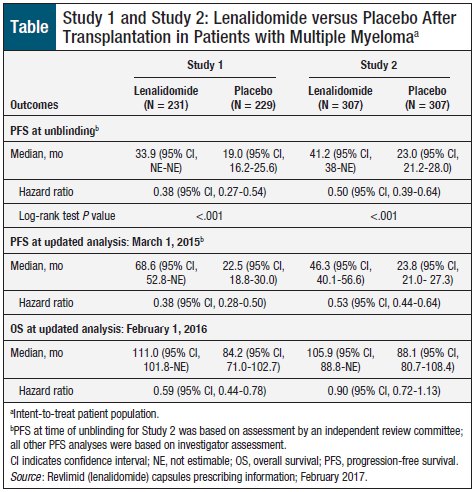 Lenalidomide after stem-cell transplantation for multiple myeloma. N Engl J Med. 2012;366:1770-1781. 11. US Food and Drug Administration. FDA approves new treatment for myelodysplastic syndrome (MDS). Press release. December 28, 2005. www.fda.gov/NewsEvents/Newsroom/PressAnnouncements/2005/ucm108546.htm. Accessed March 7, 2017. 12. US Food and Drug Administration. FDA approves lenalidomide oral capsules (Revlimid) for use in combination with dexamethasone in patients with multiple myeloma. June 29, 2006. www.fda.gov/AboutFDA/CentersOffices/OfficeofMedicalProductsandTobacco/CDER/ucm095626.htm. Accessed February 28, 2017. 13. Celgene. FDA expands indication for Revlimid (lenalidomide) in combination with dexamethasone to include patients newly diagnosed with multiple myeloma: Revlimid plus dexamethasone is now approved as an option for use in all patients with multiple myeloma. Press release. February 18, 2015. http://ir.celgene.com/releasedetail.cfm?releaseid=896912. Accessed February 28, 2017. 14. Celgene. REMS–Pharmacy Network. www.celgene.com/patients/rems-pharmacy-network/. Accessed February 28, 2017.